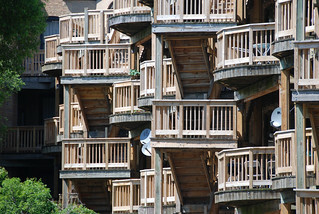 Why do most older apartment buildings in Chicago have wooden porches instead of iron fire escapes? The answer to this question is contained within an investigation from October 2013 about wooden porches / fire escapes. Short answer is: wood is cheaper than metal and legal according to fire codes.